I'm new to the antiques weapons scene. 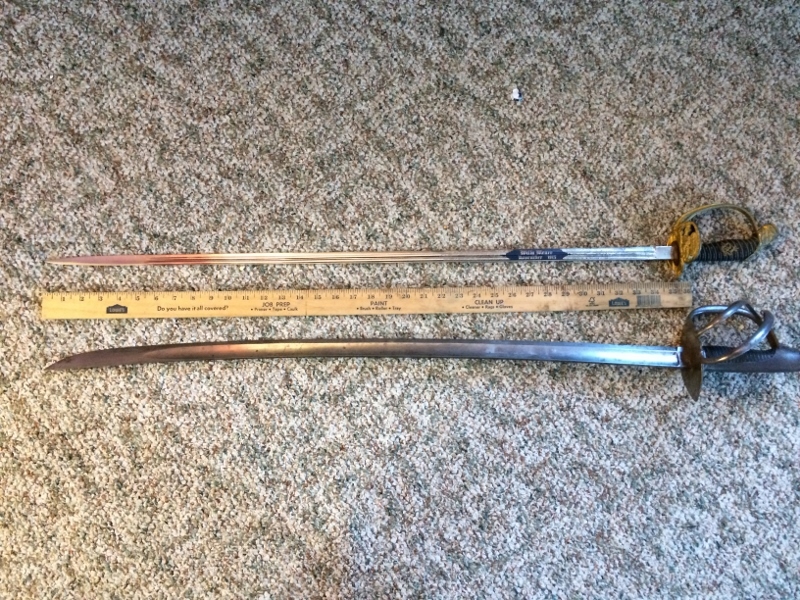 I have two older swords that I could really use some help identifying/valuing. 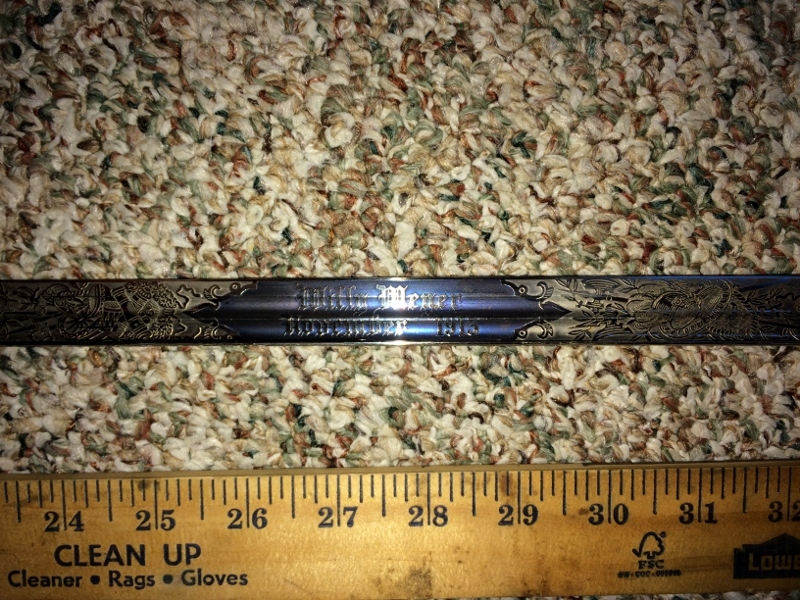 I'm mostly interested in what I've been told is a fairly common Prussian sword that has "Willy Meyer November 1913" etched into the blade with what looks like a blue background. 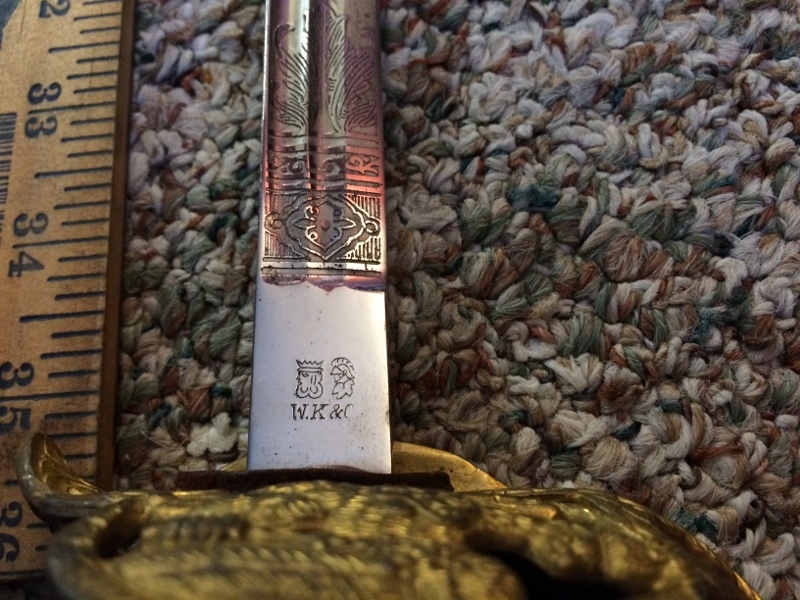 The blade is beautiful, has beautiful etching on both sides of the blade, and is in overall great condition. The only Willy Meyer I was able to find online from that time period is Wilhelm Meyer who was the commander of a U Boat. Here's the link: http://uboat.net/wwi/men/commanders/205.html From my limited research, a Prussian sword would probably not end up on a U Boat so my second question is where can I look to find the correct Willy Meyer? 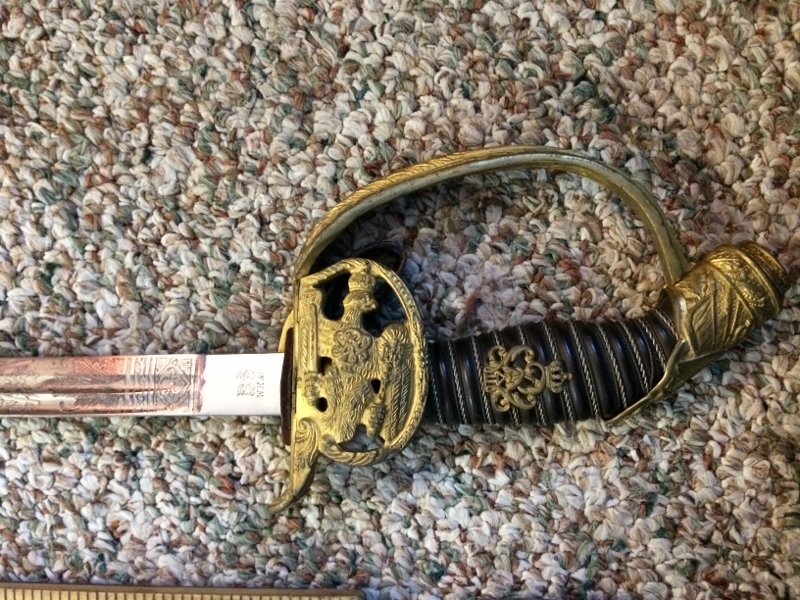 The other sword in the photos is far less fancy and not in as good condition, but I know nothing about it either. Prussian Sword has WK&C stamped on the blade and a single loop black scabbard. The other sword has the number "247." stamped on the blade, and "4880." on the blade side of the hand guard. It also has "W.R.B." 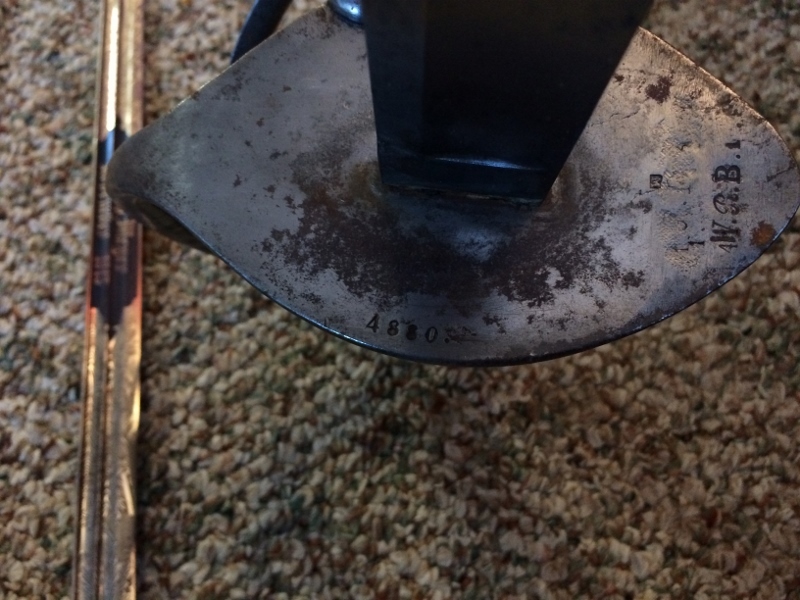 stamped over what looks like someone else's initials possibly. 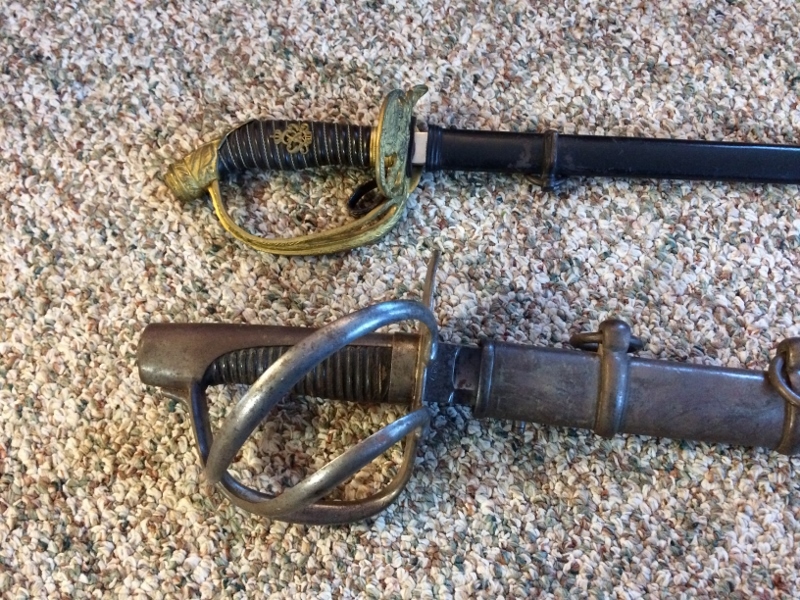 Any info on either of these swords, or where to do more research myself would be greatly appreciated. I should have added this photo of the hand guard folded down for better identification. It looks like a crowned eagle holding a sword and a scepter? Well, you might be aware that WKC stands for- WKC Stahl- und Metallwarenfabrik sword makers. Line about them. Maybe give it A Search? As you Can probably tell, I'm no expert, and have probably told you no new info. W.K &C stands for Weyersberg, Kirschbaum & Cie.
Posted: Mon 20 Mar, 2017 4:28 am Post subject: Thanks! Thanks for the quick replies. Will re-search the WK&C website better. The Willy Meyer I found had been promoted to Oberliuenenant near the end of Sept 1913. Then commanded a U boat a few years after that as kapitanliutenant. He may have had this sword in between those times. I can imagine a meter-long sword being a bad idea on a U boat. My spelling of the ranks is probably horrendous. Posted: Mon 20 Mar, 2017 6:25 am Post subject: Re: Thanks! More than likely the sword stayed home in Germany and never taken on a U-boat. Swords of this era were "bing" for official business and not typically carried on the field of battle. Sorry Dean, but the U-Boat story will not work out. You must consider that the sword you own is a Prussian infantry officer's sword. As everywhere else in the world, the Prussian U-Boat fleet was part of the Navy. As you can see, the Willy Meyer you mention was enlisted as a "Seekadett" in 1907 and remained with the Navy for the rest of his career. So if he ever owned an officer's sword, it would have been a Prussian naval sword, not the infantry model. If you want to find out something about the real owner, you will need a copy of the Prussian army officers list of 1913 and spend some time going through the differnt units, as there are about 200 officers with the name Meyer listed here. Thanks! The fact that there were different swords for Navy and infantry was a key piece of information that I was missing. That should narrow down the possibilities. I'm a little disappointed that it's not from the most famous Wilhelm Meyers from WWI, but not surprised. I guess it's like finding a random mug with "Thomas Jefferson" printed on it and finding out it was from a random Thomas Jefferson. There were probably many Wilhelm Meyers' during that time period. Any idea where to find rosters from different German units that I can begin my search? I'll start with the sword company, then branch out to infantry units. Also, any insights into what type of soldier would be issued or purchase such an elaborately decorative sword? AFAIK in most European armies of that time, a sword was a regulation part of the officer's uniform, basically a badge of rank, even if it had little practical use by then. Police officers in many countries also carried swords even though probably never used them. Just a holdover from the XIX century tradition. A highly decorated sword like this one was probably used with ceremonial / parade uniform, or perhaps was a personal item purchased to commemorate a promotion or getting an officer's rank. Someone more versed in Prussian / German army customs should be able to provide a better answer. 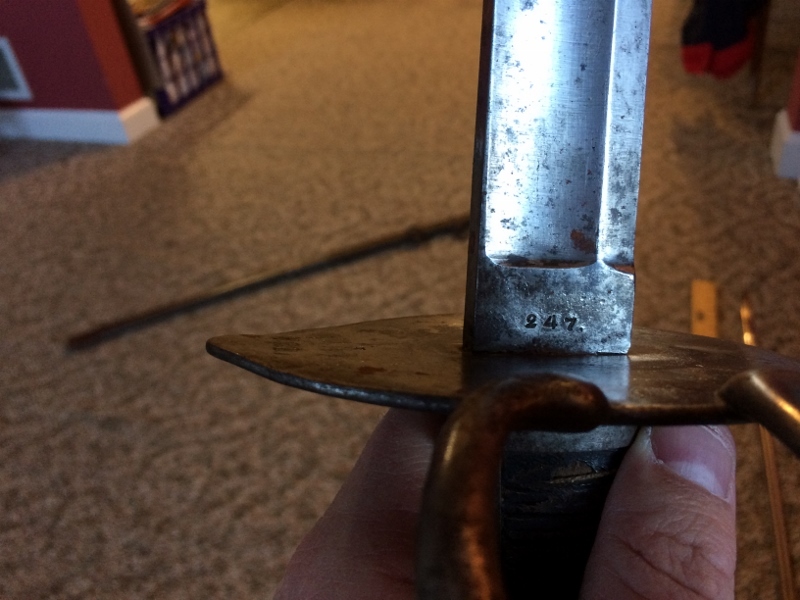 the first sword is indeed a M1889 Prussian deluxe infantry officer sword (or Luxus IOD 89). These were private purchase swords to, as stated above, commemorate one's service in the Army and carried for formal occasions and parades. That it is with a richly decorated hilt and engraved + blue etched blade indicates the man was either a superior officer (major and up) or wealthy enough to pay big money for that kind of luxury. Your other sword is a Wurttemberg cavalry trooper sword M1817. The elongated shape of the pommel cap is almost exclusive to that pattern. It's a pretty rare sword btw. Can you post the WRB stamps? It might be the regimental markings. I'm amazed by how much you know about these two completely different swords. 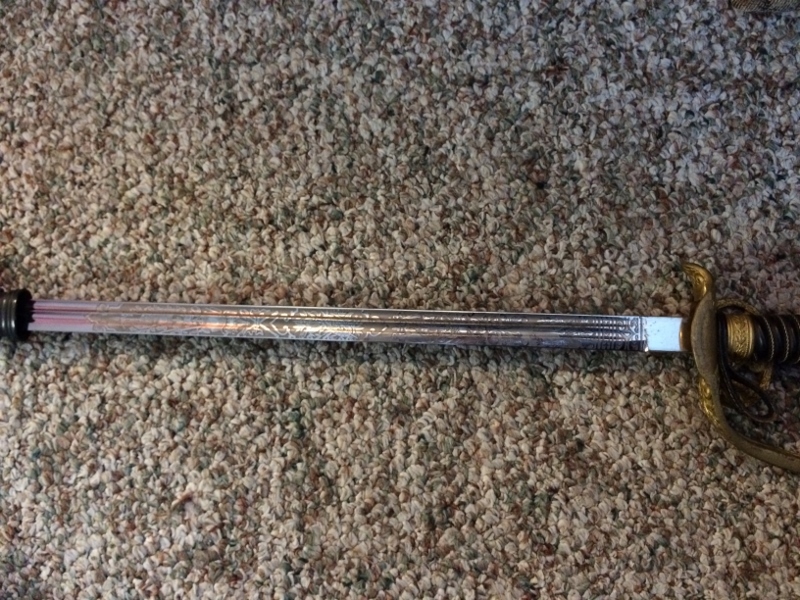 I attached the rest of my photos of the cavalry sword. I hope that anyone else searching for similar models will come across this forum. You guys are a wealth of information. W.R.B. is indeed the regimental markings that stands for Wurttemberg Reserve B...but for the B I'm not 100% sure if it should be for Bruckentrain (pioneers) or Bakerei (baker unit). When the M1817 was replaced in the cavalry by the M1859 it was recycled to supply and train units (Horse depots, transport, bridging, Ammo supply and etc.) so it's not unusual at all to see such massive swords marked as such.